Depako Analyse is used to optimize stretch foil and straps, that is, gives the optimal characteristics these tertiary package materials for given conditions. Users can submit one or more solutions which have the function of the minimum, ie. that provide safe packaging with minimum power stretch films and straps..
Cp- can be greater, less or equal to the Lp . Dp- can be greater, less or equal to the Bp . For the selected transport we calculate the optimal level of security..
Those who do not have or do not know some of the information, we will propose a one of the optimal solutions.. 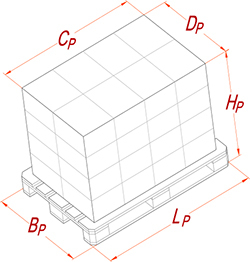 Weight of pallet: from 150 to 750 kg. wrapped pallet (stretch film or strap) , we propose a one of the optimal solutions.